AUGUSTA, GA--(Marketwire - Feb 19, 2013) - Augusta Marriott at the Convention Center offers a special setting for meetings and events, with a location in the heart of the business district and on the banks of the Savannah River. Now, with the debut of the new Augusta Convention Center, this luxury hotel has even more to offer. The hotel's event venues in Augusta now total 100,000 square feet and include contemporary, flexible space for meetings, conventions, weddings, receptions, seminars, social functions and much more. The Augusta convention center at this hotel near golf courses is also LEED-certified, meaning it was built and designed with eco-friendly principles in mind. To achieve this certification, a project must meet requirements in six categories including sustainable sites, water efficiency, energy and atmosphere, materials and resources, indoor environmental quality, and innovation and design process. The team worked with recycled/salvaged materials, installed energy-efficient lighting and much more in the building process, while daily operations include the use of biodegradable, organic products, natural air for cooling and ventilation, and bulk purchasing. Greg DeSandy, Director of Sales and Marketing at Augusta Marriott at the Convention Center, says there is a great deal of enthusiasm for the center. There are 20 events already confirmed for the new space, with more groups pending. In its opening week, February 24th, six events are planned. The Augusta Convention Center is close to more than 50 local restaurants in Augusta, but event attendees will have plenty to feed their energy and ideas with the center's creative catering menus. As the exclusive caterer to the venue, the Augusta Marriott at the Convention Center offers a delicious combination of a talented executive chef, state-of-the-art kitchen and expert catering personnel. Everything from sit-down dinners and passed hors d'oeuvres to coffee breaks and cocktail parties can be customized. For details on the Augusta Convention Center, including booking enquiries, visit http://augustaconventioncenter.net/. Set along the banks of the Savannah River in the heart of the business district, the Augusta Marriott at the Convention Center offers an elegant, upscale experience for work or play. 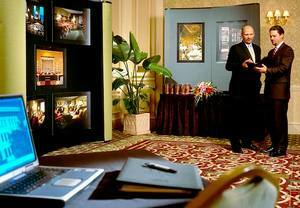 A top choice for groups and business travel, this downtown hotel features a new 38,000-square-foot exhibit hall with space for meetings, events, conferences and exhibitions of every size. Accommodations feature a warm color palette, beds with pillow-top mattresses and fluffy duvets, a desk, complimentary wireless Internet access, a 32-inch flat-screen TV, iPod dock and in-room dining. Double Parlor and standard suites are ideal for longer stays and include additional space, a refrigerator and microwave. Concierge-level rooms include access to the exclusive lounge. A fitness center and two pools help active guests stay in shape, while nearby golf courses are great for relaxation or an alternative to the board room. For Italian specialties and certified Angus steaks, head to Augustino's. Nearby explore Broad Street, Morris Museum of Art, Gallery Row, Augusta History Museum, Sacred Heart Cultural Center and the Enterprise Mill. Augusta Marriott at the Convention Center is set to host upcoming events in its new LEED-certified convention center space. Its event venues now total 100,000 square feet, with plenty of space to host various events such as meetings, conventions, weddings, receptions, seminars and more.